HP has unveiled a handful of new desktop displays including an all-in-one "Internet Monitor" that runs a cloud-centric operating system. The Passport 1912nm serves as a "visitor hub," supplying basic Web access to lobbies, hotels, waiting rooms, airports and other such environments where businesses may want to offers means of checking email, browsing the Web or watching a video, but don't require a powerful system. The 1912nm runs a basic interface on top of a lightweight Linux OS and is powered by an ARM-based Texas Instruments OMAP 4430 processor with video hardware acceleration. It also features an 18.5-inch 1366x768 display, 1GB of DDR2 RAM, 2GB of storage, five USB ports, a 4-in-1 card reader, Ethernet, speakers and it ships with a keyboard and mouse. The system is only available in the US for now with pricing set at $259. The company has also announced a pair of affordable IPS displays, the 20-inch 2011xi and 23-inch 2311xi. 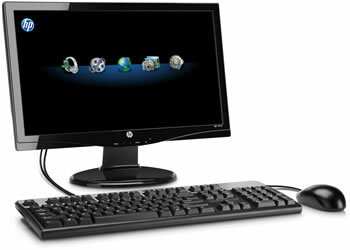 The former is priced at $170 with a resolution of 1600x900 and the latter is set at $240 with a 1920x1080 resolution. Both are LED-backlit and have 178-degree viewing angles, 3-million-to-1 and 8-million-to-1 dynamic contrast ratios, as well as VGA and DVI-D inputs. HP doesn't mention availability on the IPS screens, but their TN counterparts (the 20-inch W2071d and 23-inch W2371d) will arrive on June 24 for $140 and $200.